Overcrowded houses are a major problem in Aboriginal communities, with up to 17 people sharing a 3-bedroom house. Overcrowding leads to a wide range of problems affecting all areas of peoples' lives. Average number of people sleeping in one house (visitors included) on Palm Island, one of Australia's largest Aboriginal communities . 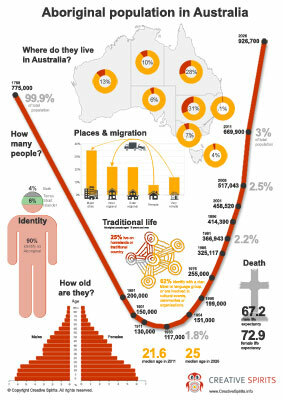 Proportion of Aboriginal people living in overcrowded houses . Percentage of "severely overcrowded dwellings" in Australia that are in the Northern Territory . Number of houses on Palm Island in 2007, a community of 3,500 people . Maximum number of people per bedroom found in one study . Proportion of Aboriginal housing budget directed to remote communities in 2007 . Times higher: The probability that Aboriginal people live in overcrowded houses, compared to non-Aboriginal people . Number of Aboriginal Australians living in severely overcrowded housing . Number of "affordable and appropriate" houses needed by Aboriginal people in 2017 . Number of homeless people in the NT who are Aboriginal . Overcrowding is a common problem in Aboriginal communities and camps. Houses and tin sheds in Alice Springs' town camp are home to 10 people on average, sometimes to 17 people , in Mowanjum, an Aboriginal community in Western Australia, about 350 people share 42 houses, most of which have only three bedrooms . Families in Western Australia's Roebourne community have to share one shower and bathroom with up to 12 people and sometimes up to four generations. The lack of privacy is another concern of overcrowding. Rates of overcrowding increase with remoteness, affecting 13% of adults in major cities, 20% in regional areas and 48% of those in remote areas . In some remote communities two-thirds of Aboriginal people live in overcrowded houses. A UN Special Rapporteur on Adequate Housing wrote in his report in 2007 : "The conditions that I saw of overcrowding, up to 30 people living in one house, and the fact that these conditions have existed for 7 decades, it is definitely amongst the worst I've seen around the world." He also noted that Australia lacked a "clear, consistent, long-term and holistic housing strategy" as well as a national legislative framework against which initiatives could be measured. Why live so many people in one house? Houses can overcrowd temporarily or permanently. Family visiting. Family come from their homes in remote communities into town and stay with their relatives. They come in for shopping or visiting family who are in town because they have to be on dialysis. 21% of families in remote or very remote communities had temporary visits lasting two weeks or more in the previous 12 months . Sorry business. Mourning a death in the family can take several days, so families have to stay with other Aboriginal people. More than half of temporary visits was due to cultural reasons, only a quarter due to holidays . Uninhabitable houses. According to the 2002 National Aboriginal and Torres Strait Islander Social Survey, 40% of Aboriginal people in non-remote (32%) and remote areas (58%) reported that their homes were structurally unsound (e.g. rising damp or major cracks). 7% needed to be completely replaced . Choice of lifestyle. Some families will choose to live in large, multi-generational households, despite other houses being available in the community. These families will not necessarily consider their house to be crowded, but could suffer the same health effects (see below). Overcrowded houses can affect every aspect of your life. Domestic violence. Overcrowding leads to stress, fighting and drinking. Poor mental health. Exposed to such conditions for a long time, people can suffer "enormous mental health problems",  for example depression. Lack of safety. The lack of safe and adequate housing in remote communities is a key driver for people to move to urban centres, live on the street or in bush camps. Diseases spread fast. Overcrowding is a "direct cause" of ear and eye disease, according to Chips Mackinolty, a health adviser for the Aboriginal Medical Services Alliance of the NT . Overcrowding also helps spread antibiotic-resistant infections such as Methicillin-Resistant Staphylococcus Aureus (MRSA) which is a common cause of skin infections and may also cause more severe bone, joint and bloodstream infections . Meningococcal disease, rheumatic fever, tuberculosis and respiratory infections are other diseases that spread easily when too many people live too close to each other. Children don't have an environment where they can learn for school, and many develop behavioural problems which negatively impact their life. "One of the biggest issues hindering school attendance is overcrowding on the island," explains Bryan Hughes, Principal, Shepherdson College, Galiwin'ku, Elcho Island, Northern Territory . "An average of 15 people live in each house, and one house has 54 occupants. The houses have only three or four bedrooms, so families sleep in shifts and older students and adults walk the streets at night. At 2am, there can be 40 to 50 or even 100 people walking around the community, and we're expecting these kids to be at school in the morning." What does the speaker want to say? What does it mean that "families are overcrowded"? Create a table comparing the characteristics of Aboriginal and non-Aboriginal families. Intuitively one would measure the level of overcrowding by dividing the number of people in a community by the number of its houses. If, for example, a community has 20 houses and 120 people live in the community, its "crowding level" is 6 people per house. The National Indigenous Housing Guide (NIHG) is a key compliance document for the government's National Indigenous Housing program. It stipulates that houses need to be beneficial to their residents' health. The NIHG's highest health priority is the ability to wash .
Statistical data shows that only 35% of houses have a functioning shower , which means only 7 houses can serve the community's need to wash. This means a functional crowding level of 17 people per house to have a shower. Other examples include people's need for cooling or heating with the crowding level depending on functional fans or air-condition units. Thus, overcrowding can fluctuate over the course of a day, depending on the needs of the people in the community. With the poor record of the government's housing program, crowding levels are likely to be much higher than simple maths suggests. The Health Habitat website shows how it is more feasible to repair and maintain existing houses than building new houses to reduce overcrowding levels. Some housing companies use overcrowding as a reason to evict tenants after complaints from neighbours, overlooking that Aboriginal people have cultural obligations to care and look after family and relatives. Camps and houses have always been meeting places, and evicting people when they live their cultural obligations is a racist attitude. Aboriginal people feel that their family values not accepted. "We are judged on our poverty. We are judged on the 'cleanliness' of our houses, a hangover of the mission days when the white-gloved hand ruled. We are judged on what is in the cupboard or the fridge without recognising that our children go to nan's, aunt's, cousins, etc. We have community. We have an extended family within and without," observes Ray Jackson, president of the Indigenous Social Justice Association . A Dubbo Aboriginal family with 8 children wanted to escape their overcrowded home. But it was not meant to be. The Aboriginal Housing Organisation (AHO) had planned to buy a 5-bedroom house in Beveridge Crescent, South Dubbo, to help the family. It was told the house, with a price tag of around $400,000, was "outside of standards" for public housing and not to proceed. A local newspaper reported Beveridge Crescent residents' fears that Aboriginal public housing would lower the values of their surrounding properties. "We have seen what happens to homes purchased and we are saying not in our street," said one resident, who asked to remain anonymous. "We would like the value of our homes to remain as they are and rise again when times get better. "We are all hard-working, honest people, many of us built our homes here and many more made the decision to purchase and stay in this great street." The home in question had five bedrooms, three bathrooms - one with a spa - a rumpus room, air-conditioning and a paved patio. The residents indicated they felt the purchase of such a home would be an abuse of taxpayers' funds. Dubbo MP Dawn Fardell undertook to speak to NSW Housing Minister David Borger about the issue. The day after the newspaper report, Mr Borger told AHO to look elsewhere or to look at building extensions onto existing properties . Is it true that people of another race can lower the value of your home if they live next door? What does "we have seen what happens to homes purchased" allude to? How could it be overcome? "We are all hard-working, honest people" -- What implied the resident with this statement? Why did residents feel a purchase would have "abused" taxpayers' funds? Do you think what the Housing Minister did was righteous? Consult the UN Declaration of Human Rights.